Venezuelans living in Honduras hold a protest against Venezuelan President Nicolas Maduro's government in Tegucigalpa, Honduras, Jan. 23, 2019. France and Britain are the latest countries Thursday to throw their weight behind the popular street protests seeking to force Venezuela's President Nicolas Maduro to step aside, dubbing the embattled Latin American ruler "illegitimate." As hundreds of thousands of Venezuelans protested in their bid to oust Maduro — in scenes reminiscent of the popular uprising in Ukraine in 2014 that toppled a pro-Moscow ruler — France's Emmanuel Macron tweeted his support, saying he "welcomes the courage of the hundreds of thousands of Venezuelans who march for their freedom." 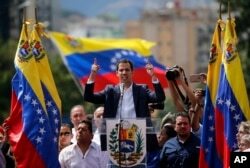 Venezuelan opposition leader and head of the country's National Assembly Juan Guaido declared himself Venezuela's interim leader Wednesday, winning the immediate backing of Washington and several Latin American states, including Venezuela's neighbor Colombia. FILE - Juan Guaido, head of Venezuela's opposition-run congress, declares himself interim president of the nation until elections can be held during a rally demanding President Nicolas Maduro's resignation in Caracas, Venezuela, Jan. 23, 2019. 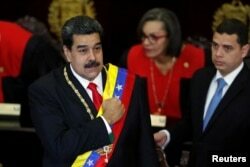 His move prompted Maduro, who has led the oil-rich nation since 2013, to sever diplomatic ties with the United States and demand its 75 diplomats leave the country. U.S. President Donald Trump has refused to withdraw the diplomats on grounds that he doesn't acknowledge Maduro as legitimate and because Guaido has asked them to remain. The number of nations supporting Guaido is growing, while Russia and China led the drive to try to keep the leftist Maduro in power. The leftist leaders of Mexico, Cuba and Bolivia are backing Maduro. For Moscow and Beijing, the stakes are high. The two are Venezuela's largest creditors, having acted as lenders of last resort for the Maduro regime in a bid to prop up the country's imploding economy. Last month, Russia sent two nuclear-capable bombers to Venezuela to participate in military maneuvers. "We consider the attempt to usurp sovereign authority in Venezuela to contradict and violate the basis and principles of international law," Kremlin spokesman Dmitry Peskov said Thursday. ​Much as it did in 2014 over the popular uprising that ousted Ukraine's Viktor Yanukovych, Kremlin officials dub the street protests in Venezuela a Western plot. Alexei Pushkov, chairman of the information committee at Russia's Federation Council, called Guaido's declaration "an attempted coup" orchestrated by Washington — a claim echoed by Maduro in a televised broadcast in which he said, "We've had enough interventionism here. We have dignity, damn it." Britain's Prime Minister Theresa May's spokesman said Maduro's election was neither free nor fair, and expressed support for Guaido as national assembly head. The European Union, which has imposed sanctions on Venezuela and boycotted Maduro's swearing-in, has been more cautious, stopping short of following Washington in recognizing the 35-year-old Guaido as acting president. But Brussels has called on authorities in Caracas to respect the opposition leader's "civil rights, freedom and safety" and indicated it favored a peaceful transition away from Maduro. "The people of Venezuela have massively called for democracy and the possibility to freely determine their own destiny. These voices cannot be ignored," the 28-nation bloc said in a statement. 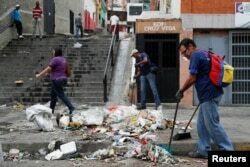 Workers clean the street after a protest in Caracas, Venezuela, Jan. 24, 2019. Speaking later to red-shirted supporters outside the presidential palace, Maduro recited U.S. interventions in Latin America during the Cold War. "Don't trust the gringos," he said, adding they only have "the ambition to take Venezuela's oil, gas and gold." "It's impossible to imagine that this was spontaneous," Pushkov said in a television interview. It was "a preplanned action, and it was certainly coordinated by the United States," he added. Turkey's President Recep Tayyip Erdogan has also joined in with the Russian complaints, assuring Maduro in a telephone call Thursday, "We are with you." According to Erdogan's spokesman Ibrahim Kalin, the Turkish leader said the democratic process should be respected. Turkey has been refining and certifying Venezuelan gold since last year after Maduro switched operations from Switzerland, fearing Venezuelan gold could end up being impounded. Security forces look on while clashing with opposition supporters participating in a rally against Venezuelan President Nicolas Maduro's government and to commemorate the 61st anniversary of the end of the dictatorship of Marcos Perez Jimenez in Tachira, Venezuela, Jan. 23, 2019. At least 60 countries have now thrown their support behind Guaido and the street protesters. Last week 17 Latin American countries, as well as the U.S., Canada and 28 member states of the EU, declared Maduro a "dictator." They pointed to Venezuela's constitution, which says in the event the presidency is determined to be vacant, elections should be called within 30 days, and the head of the congress should assume control of the government. Inflation is now running at 1.7 million percent — food and basic staples are scarce, and most Venezuelans are earning less than $10 a month. The success of the uprising will depend on whether the military and the regime's intelligence apparatus continue to support Maduro, analysts say. The embattled ruler has long sought to maintain the military's favor by handing out lucrative posts and sinecures to the top generals, who in effect control the state oil monopoly. 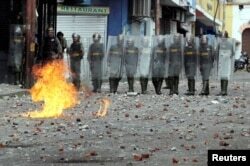 More than 20 national guardsmen broke with Maduro on Monday, seized an arsenal and declared themselves in rebellion, but were quelled by other units.